The TL6R Compact Track Loader features a radial lift loader design and meets all current emission standards. With a height of 6 ft 5.8 in and a width of just over 5 ft the dimensions of the TL6R allow it to excel on job sites that may have height and width restrictions. 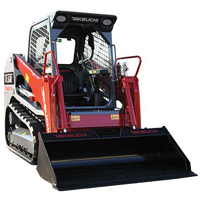 This track loader comes with a newly designed cabin with an overhead 5.7” color multi-informational display and backlit rocker switches that control a variety of machine functions. The TL6R comes standard with a quiet track design with flotation pads that reduces vibration, noise levels, and improves ride quality. Powerful Drives – Double reduction planetary drives provide exceptional pushing power, delivering maneuverability, outstanding performance, and the standard two speed travel allows for increased travel speeds. Dual Flow Auxiliary Hydraulics – Features multiple attachments presets and the ability to change hydraulic flow within the 5.7′ monitor display. Active Power Control – Maintains engine power for optimal performance, and it may be engaged or disengaged by the operator. Quiet Ride Track – Allows rollers to ride on a rubber contact pad for reduced vibration and a quieter ride, and the wide block tread improves flotation. 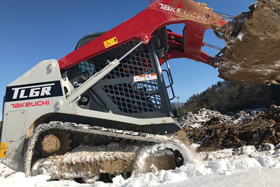 Total Package – Outstanding operating capacity coupled with tremendous breakout force allow you to get the job done more efficiently. Built to Last – The heavy duty rear door is built to protect the radiator and hydraulic oil cooler from rear impacts, and will provide years of service and dependability. Model Specific Oversized Undercarriage Components – For long lasting durability. TL6R features double and triple flange track rollers for less susceptibility to detracking. Open Up – With a tilt back operator’s station and large removable belly pans routine maintenance and cleaning is easy to perform. Access to Maintenance Items – Many key maintenance items are accessible from the rear of the machine: engine oil fill and filters, engine oil dipstick, coolant reserve tank, fuel water separator, and air cleaner. Two Large Belly Pans – For easy clean out of dirt and debris. Two smaller access panels for engine oil drain and fuel water separator.